It was a blazing hot summer afternoon in Hampi. As I walked out of the magnificent Vithala Temple, my throat was parched. Even my sweat had dried in this arid North Karnataka summer. The sight of this woman under a bright red umbrella, tending a cooler with drinks was an oasis of bliss to a weary traveler. I ambled over and quickly gulped two bottles of my favorite: Limca! Aaaah! I bought a few more bottles for M and the driver. She charged me 12 rupees for each. I gave her the money. But ever eager to practice my kannada and engage in conversation, I asked here only jokingly, why it was 12 rupees here, while it was only 10 rupees in the city. She must have been surprised by my heavily accented and rudimentary kannada, and realizing I was joking, she started giggling. I could not keep a straight face and started to laugh too. I made small talk, asked her name and generally how many drinks she sold in a day. Her name was Uma and she sold about a crate (of 12) each day. I estimated she made 4 rupees profit on each bottle, netting her about 50 rupees a day (slightly more than a dollar)! And for that she had to stand in this heat all day! And some one had to drop her here and pick her up in the evening. And she has not yet eaten! Life is tough! But she had a certain calm about her and I think this pic radiates her inner peace. And her confidence! As I prepared to leave, I asked her again why it was 12 rupees for each drink: yaakae hutnerdu rupaiya? Now she really burst out laughing, and I laughed with her. After a few moments she composed herself, then lifted the lid of the cooler, pointed inside and with a twinkle in her eyes mouthed a single word: Ice! On this blistering hot day, she knew the magic word. For that thirst-quenching ice cold drink, I would gladly have paid twice as much! I was gifted this small, yet well done bronze of Uma by my cousin brother Ramnath. He has a good eye for art work. This is Uma (Parvati) as Shivakami – the beloved of Shiva, in a classic tribhanga pose. This is purported to be a late 18th century reproduction of the 11th century piece from the Kulottunga I era. I have had this for several years and I never tire of admiring it. It is small and fits nicely in the palm of my hand. I am drawn to her graceful pose. I am drawn to her exceptional beauty. I am drawn to the inner calm she radiates! And I am drawn to the confidence she exudes! The craftsmanship is exquisite for so tiny a piece and we have no idea where this statuette resided for the last several centuries. The sharp features suggest she was not used for any puja. Prolly stayed in a noble household. It is said that the easiest way to reach Shiva is to appease Parvati (or Uma) and have her champion you to Shiva! Perhaps it is that restlessnes in my heart that draws me to her. I certainly thirst for her grace! And every time my eyes fall on Uma, I know my thirst will soon be quenched. Viji – thank you for visiting! There is so much beauty in India – i worry a lifetime is not going to be enough. I pray to be reborn in India so I may revel in all its splendour, … over and over again! Arun, I second vegeyum too…. The respective backgrounds make both the Umas stand out even more. One of these days I am planning on visiting these places. I have a few bigger (and more expensive) bronzes, but this is certainly one of my favorites – after that of Krishna! Radiates beauty, peace and confidence; all attributes of a devi! I see a lot of similarities and they kinda go together, no? Both Umas are beautiful. Full of peace, poise and grace. Yes, Indeed what grace and confidence this statue imparts. Love the bright background, makes the statue stand out even more.. Kudos to you on your discipline to do the monday fasts; I can’t fast for more than a few hours! Summer is a great time to visit Boston; and M would love to meet you too. Depending on where you are in CT, it shouldn’t take more than a two hours. 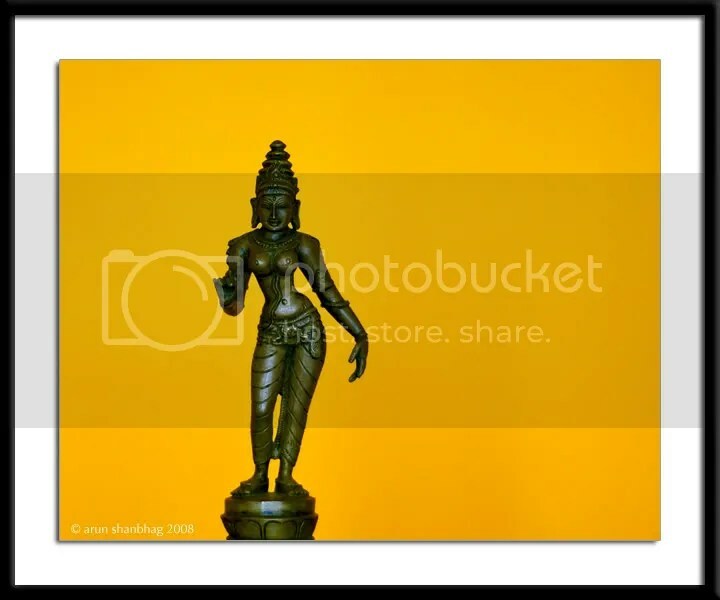 Oh I love this statue of goddess parvati…. I too am drawn to her after keeping so many monday fasts in her name… gives me a lot of peace….